A native to coastal Brazil, the bougainvillea was discovered in 1768 in Rio de Janeiro by French naturalist Dr. Philibert Commerçon (also sometimes spelled Commerson). The plant is named after his close friend and ship’s admiral Louis-Antoine de Bougainville, who commanded the ship La Boudeuse that sailed around the world between 1766-1769, and in which Commerçon was a passenger. Bougainvillea glabra is the most common variety used in the garden and is a long-flowering variety that can also be used for bonsai. Bougainvillea peruviana is less vigorous with glabrous leaves and purplish pink smaller bracts. 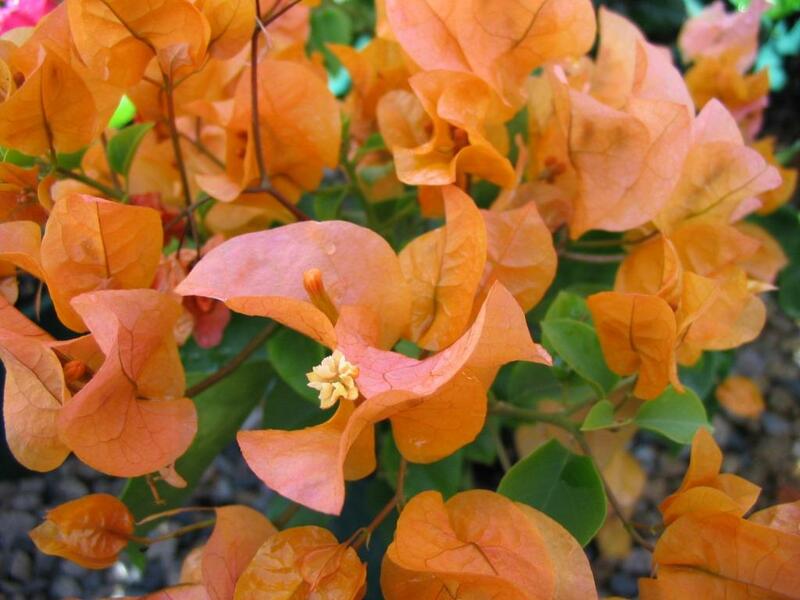 Bougainvillea spectiabillis has the darkest green leaves and bracts of bright red or purple. Bougainvillea have been hybridized, similar to roses, and have many named varieties. 'Orange Queen' which has orange bracts that change to pink, 'Hawaiian Gold' has golden orange bracts turning pink over time. There is also a variegated leaf variety called 'Raspberry Ice' a profuse bloomer that produces fuchsia red flowers. 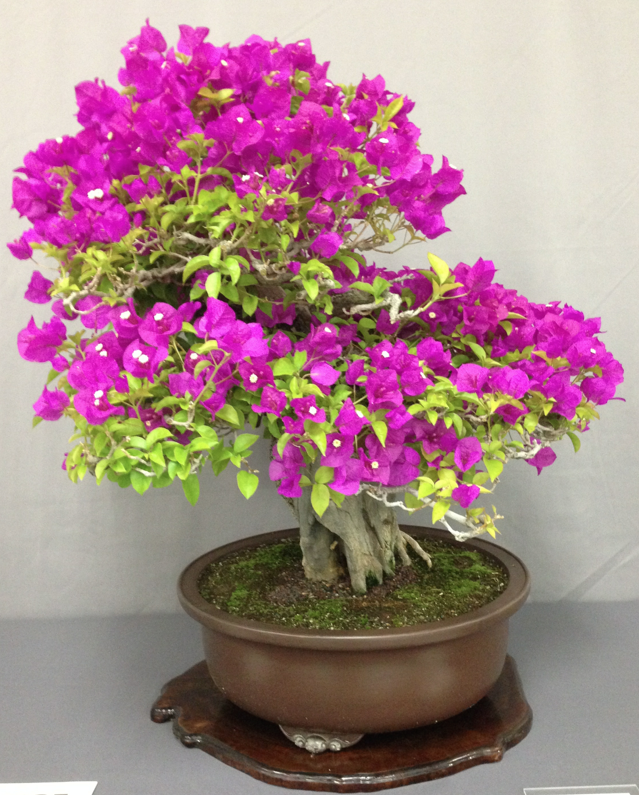 Bougainvillea 'Bambino' varieties are new on the market and are good for bonsai. They are compact, shorter growers, and they have fewer thorns. Some varieties offered for sale are 'Zuki', 'Pedro', 'Zulu', 'Zeffa', 'Panda' and 'Jalibene'. Bougainvillea has an extremely fine root system, will grow best in well-drained loamy soil (made up of equal parts sand, silt, and clay), mixed with organic matter which allow nutrients and oxygen to more easily reach the roots. Use a soil mix described as "quick draining" Do not use any kind of water-retaining soil as this may cause root rot and leaf spots to appear, be sure to select a well-draining soil. 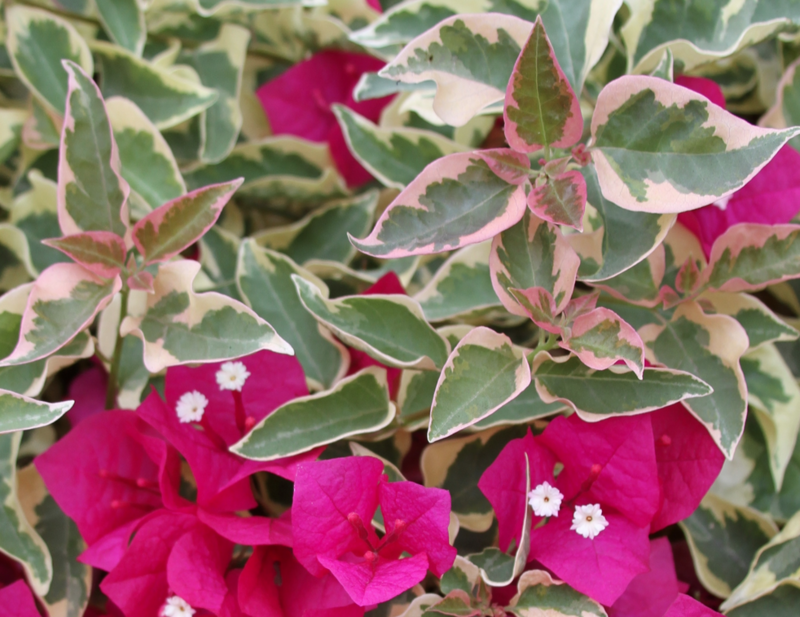 Bougainvillea is drought and salt tolerant and needs little water once it is established. In the warmer months, make sure your bougainvillea plant is well but not overwatered. Overwatering causes the plant to lose leaves, wilt or not flower. Overwatering may also cause bougainvillea plant to die from root rot, proper watering by using this simple rule of thumb: If few leaves, but some color – not enough water; If lots of leaves, but little color – too much water; If a combination of healthy leaves and color – just right; avoid frequent, light watering since this will promote a weak and shallow root system. Bougainvillea usually does not have any problems with insect pests or diseases, but worms, snails and aphids may attack this plant. Bougainvillea thrive outside for the best results put your bougainvillea in full sun. If you want good blooming give them at least 5 to 6 hours a day of full sunlight as a minimum. More hours of direct sun is better, less than 5 hours and the plant may not bloom very well. Your plants will thrive in shade or partial shade, but only have nice growth with little or no blooms. Bougainvillea are hardy throughout the South but young growth will be damaged by frost. For best results, night temperatures should stay above 60°F (15°C) while daytime temperatures can exceed 100°F (38°C) without ill effect. Bougainvillea are heavy feeders, and they require regular application of slow a release fertilizer. We recommend fertilizer with high iron and other micronutrients to strengthen delicate roots and intensify color. Regularly feed your plant with a balanced fertilizer (6-8-9) high in iron and other micronutrients for color of bracts and foliage. Important techniques to promote the greatest growth and flowering, as bougainvillea only bloom on new growth. Pruning is important not only for shape but for strength as well since bougainvillea tend to grow outward without creating branches unless their stems are pruned. They can be pruned hard if growth is excessive. Pruning a bougainvillea, is the act of removing entire branches or major structural parts of the plant. This could be anywhere from several inches to several feet depending on the size of your bougainvillea. Pruning is performed with pruning shears. Pruning a bougainvillea is recommended when entire branches are deterring from the overall shape of the plant, or jeopardizing the structural integrity of the bougainvillea. Trimming a bougainvillea, removing just the ends of branches or shoots. This could be anywhere from an inch to several feet, depending on the size of your plant. 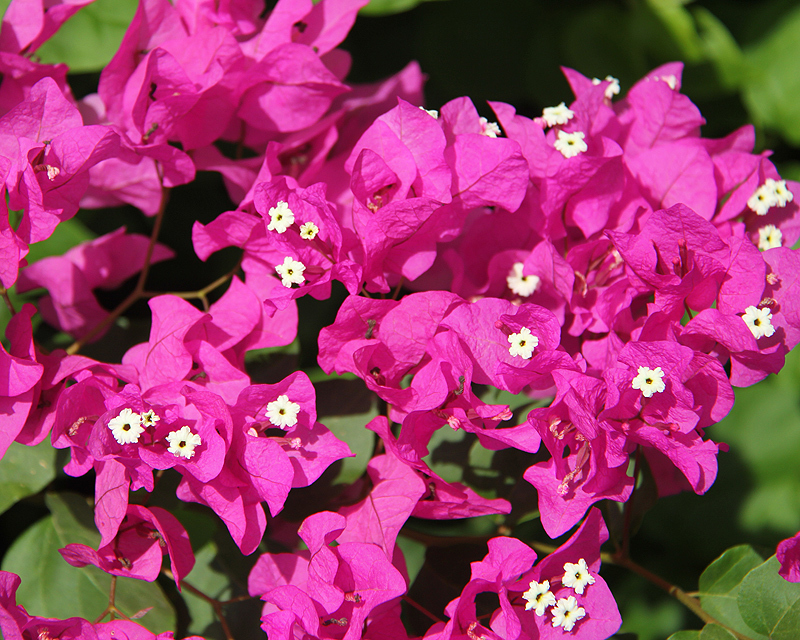 Bougainvillea may be pruned, trimmed, and pinched at any time of the year. 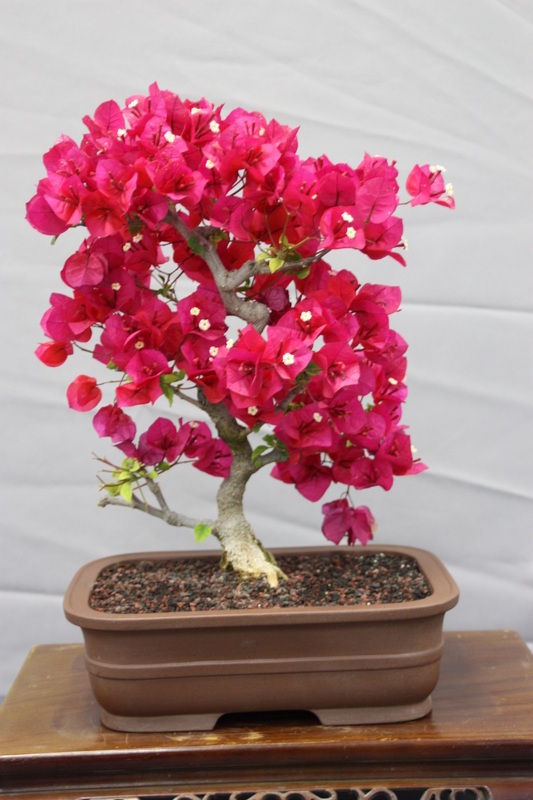 Bloom initiation does not depend upon trimming, bougainvillea has a bloom cycle followed by a rest period whether trimmed or not. However, trimming or pinching is recommended after the end of each blooming cycle or at the beginning of the rest period to promote branching and budding for the next bloom cycle. Bougainvillea that are pruned back, bloom more. The more you cut back the more blooms you will have. 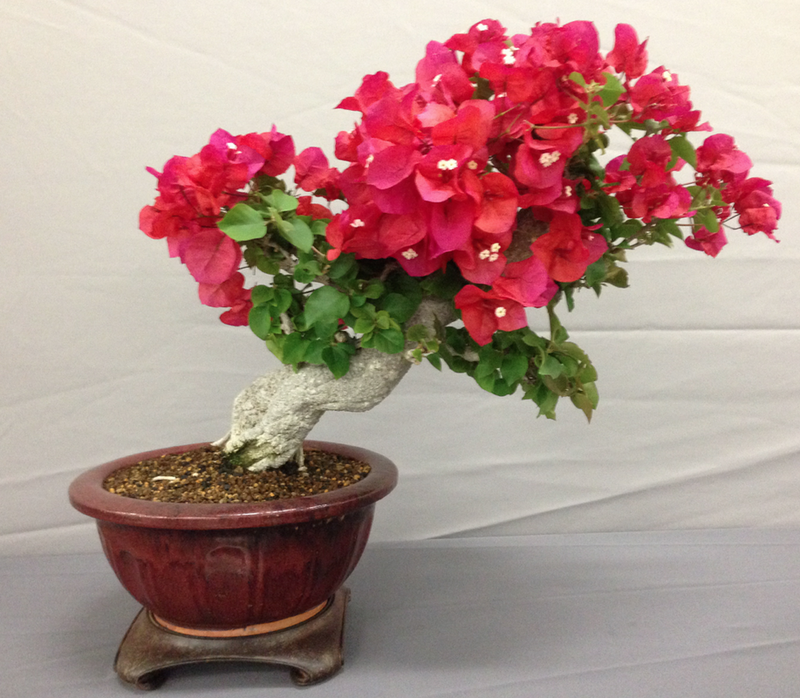 A bougainvillea blooms best when pot-bound so do not be tempted to re-pot unless you must. It is best to leave the plant in its original container until the roots have replaced all of the soil and you can’t keep the plant well watered. Root pruning is not recommended when re-potting bougainvillea, in fact, disturb the roots as little as possible because the plant might go into shock and take weeks to recover. Bougainvillea love to be pot-bound, so pot in the smallest container available for the purpose you desire. The root system needs time to grow into each new pot.